Answer to King's Letter to be printed. Exceptions from Bill of Pardon. ORDERED, That the Letter sent to his Majesty from this House, in Answer of his Majesty's gracious Letter to this House, be forthwith printed and published. Mr. Turner reports from the Committee for Privileges and Elections, touching the double Return for the Borough of St. Edmond's Bury in the County of Suffolk, that, upon Examination of the Fact, the Committee are of Opinion, That Mr. Chaplyn and Mr. Clarke, who are returned by one Indenture, ought not to sit; and that Sir Henry Crofts and Sir John Duncombe Knights, mentioned in the other Indenture, are duly elected, and ought to sit. Resolved, That this House doth agree with the Committee, That the said Sir Henry Crofts and Sir John Duncombe are duly elected; and that they do sit in this House: And that the Indenture, signed by the Inhabitants of that Borough, whereby the said Mr. Chaplin and Mr. Clarke are returned, be withdrawn, and taken off the File: And that the Alderman of the said Borough, with the Clerk of the Crown, be sent for, to attend for the amending of the Return accordingly. 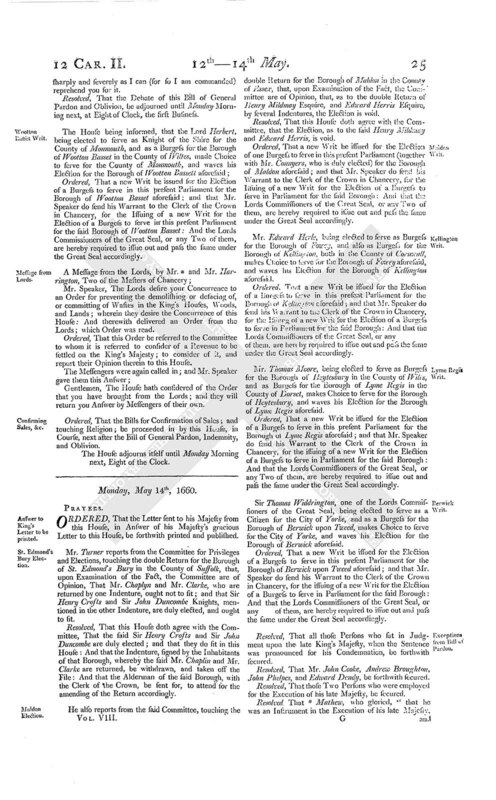 He also reports from the said Committee, touching the double Return for the Borough of Maldon in the County of Essex, that, upon Examination of the Fact, the Committee are of Opinion, that, as to the double Return of Henry Mildmay Esquire, and Edward Herris Esquire, by several Indentures, the Election is void. Resolved, That this House doth agree with the Committee, that the Election, as to the said Henry Mildmay and Edward Herris, is void. Ordered, That a new Writ be issued for the Election of one Burgess to serve in this present Parliament (together with Mr. Connyers, who is duly elected) for the Borough of Maldon aforesaid; and that Mr. Speaker do send his Warrant to the Clerk of the Crown in Chancery, for the Issuing of a new Writ for the Election of a Burgess to serve in Parliament for the said Borough: And that the Lords Commissioners of the Great Seal, or any Two of them, are hereby required to issue out and pass the same under the Great Seal accordingly. Mr. Edward Herle, being elected to serve as Burgess for the Borough of Fowey, and also as Burgess for the Borough of Kellington, both in the County of Cornwall, makes Choice to serve for the Borough of Fowey aforesaid, and waves his Election for the Borough of Kellington aforesaid. Ordered, That a new Writ be issued for the Election of a Burgess to serve in this present Parliament for the Borough of Kellington aforesaid; and that Mr. Speaker do send his Warrant to the Clerk of the Crown in Chancery, for the Issuing of a new Writ for the Election of a Burgess to serve in Parliament for the said Borough: And that the Lords Commissioners of the Great Seal, or any of them, are hereby required to issue out and pass the same under the Great Seal accordingly. Mr. Thomas Moore, being elected to serve as Burgess for the Borough of Heytesbury in the County of Wills, and as Burgess for the Borough of Lyme Regis in the County of Dorset, makes Choice to serve for the Borough of Heytesbury, and waves his Election for the Borough of Lyme Regis aforesaid. Ordered, That a new Writ be issued for the Election of a Burgess to serve in this present Parliament for the Borough of Lyme Regis aforesaid; and that Mr. Speaker do send his Warrant to the Clerk of the Crown in Chancery, for the issuing of a new Writ for the Election of a Burgess to serve in Parliament for the said Borough: And that the Lords Commissioners of the Great Seal, or any Two of them, are hereby required to issue out and pass the same under the Great Seal accordingly. Sir Thomas Widdrington, one of the Lords Commissioners of the Great Seal, being elected to serve as a Citizen for the City of Yorke, and as a Burgess for the Borough of Berwick upon Tweed, makes Choice to serve for the City of Yorke, and waves his Election for the Borough of Berwick aforesaid. Ordered, That a new Writ be issued for the Election of a Burgess to serve in this present Parliament for the Borough of Berwick upon Tweed aforesaid; and that Mr. Speaker do send his Warrant to the Clerk of the Crown in Chancery, for the issuing of a new Writ for the Election of a Burgess to serve in Parliament for the said Borough: And that the Lords Commissioners of the Great Seal, or any of them, are hereby required to issue out and pass the same under the Great Seal accordingly. Resolved, That all those Persons who sat in Judgment upon the late King's Majesty, when the Sentence was pronounced for his Condemnation, be forthwith secured. Resolved, That Mr. John Cooke, Andrew Broughton, John Phelpes, and Edward Dendy, be forthwith secured. Resolved, That those Two Persons who were employed for the Execution of his late Majesty, be secured. Resolved, That * Mathew, who gloried, "that he was an Instrument in the Execution of his late Majesty, and that he had a Reward of Three hundred Pounds for it," be forthwith secured. Resolved, That Cornet Joice, who seized upon the Person of his late Majesty at Holmeby, be forthwith secured. Resolved, That a List of the Names of those Persons who sat in Judgment upon the late King's Majesty, and are, by an Order of this Day, to be secured, be delivered to the Serjeant at Arms attending this House: And all Officers, both Civil and Military, are required to give Assistance to the said Serjeant, his Deputy, and Deputies, in the Securing of those Persons, and such other Persons, as are this Day ordered to be secured. Resolved, That the Serjeant at Arms attending this House do forthwith take care to secure all the said Persons accordingly. Resolved, That Mr. Villiers, alias Danvers, who hath sat this present Parliament in this House, as a Member thereof, be summoned to attend To-morrow Morning, to answer the Charge which was this Day offered against him: And that Col. Eyre do then attend to make good the Charge. Resolved, That Mr. John Cooke, who is now in Custody in Ireland, be forthwith sent over hither in safe Custody. Resolved, That the Number of Seven, of those who sat in Judgment when Sentence was given upon the late King's Majesty, be the Number who shall be excepted, for Life and Estate, out of the Act of General Pardon and Oblivion. Resolved, That the Debate of this Bill of General Pardon and Oblivion, be adjourned until To-morrow at Eight of the Clock. 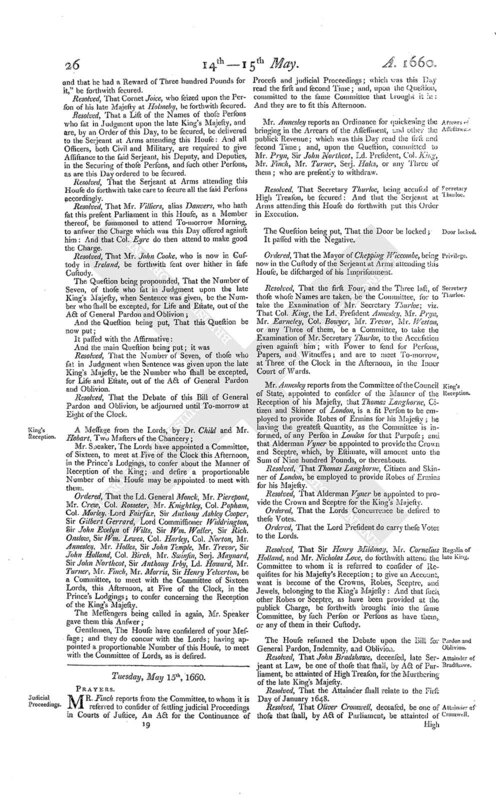 Mr. Speaker, The Lords have appointed a Committee, of Sixteen, to meet at Five of the Clock this Afternoon, in the Prince's Lodgings, to conser about the Manner of Reception of the King; and desire a proportionable Number of this House may be appointed to meet with them. Ordered, That the Ld. General Monck, Mr. Pierepont, Mr. Crew, Col. Rosseter, Mr. Knightley, Col. Popham, Col. Morley, Lord Fairfax, Sir Anthony Ashley Cooper, Sir Gilbert Gerrard, Lord Commissioner Widdrington, Sir John Evelyn of Wilts, Sir Wm. Waller, Sir Rich. Onslow, Sir Wm. Lewes, Col. Harley, Col. Norton, Mr. Annesley, Mr. Holles, Sir John Temple, Mr. Trevor, Sir John Holland, Col. Birch, Mr. Swinfin, Serj. Maynard, Sir John Northcot, Sir Anthony Irby, Ld. Howard, Mr. Turner, Mr. Finch, Mr. Morris, Sir Henry Yelverton, be a Committee, to meet with the Committee of Sixteen Lords, this Afternoon, at Five of the Clock, in the Prince's Lodgings; to confer concerning the Reception of the King's Majesty. Gentlemen, The House have considered of your Message; and they do concur with the Lords; having appointed a proportionable Number of this House, to meet with the Committee of Lords, as is desired.